Quality Inputs Features 4 balanced XLR mic preamps resulting in high input gain and low noise floor. AUX Line Inputs 4 additional line level inputs via RCA connectors are provided. These inputs are perfect for adapting consumer level devices such as CD and cassette players, audio from VCR's etc. 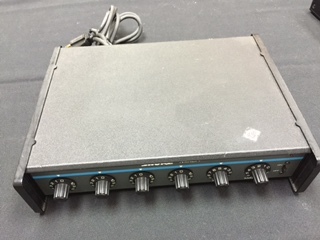 12V Phantom Power The SCM 268 provides 12V phantom power for condenser microphones. Compact Rugged Design The SCM 268's rugged, compact design provides maximum portability without sacrificing the ruggedness.